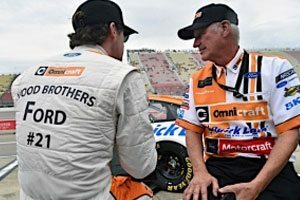 It took a second attempt in Round Two of qualifying at Michigan International Speedway, but Ryan Blaney was able to advance to the final round and put the No. 21 Omnicraft Ford Fusion in sixth place for the start of Sunday’s FireKeepers Casino 400. 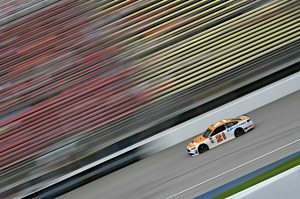 Blaney, fresh off a victory at Pocono Raceway, was ninth fastest in the opening practice at Michigan with a best lap of 199.545 miles per hour. He was ninth fastest in the opening round of qualifying, which allowed him to advance to the second of three qualifying rounds. His first attempt in Round Two was not fast enough to be among the 12 drivers who advanced to the third round, so he made a second attempt and wound up eighth fastest at that point. The extra lap on his tires hurt his speed in the final round, but his final lap at 200.854 mph led to a net gain of nine positions, from 15th place where he likely would have started if he hadn’t made a second attempt in Round Two. “We made better adjustments for the second run,” Blaney said. “We didn’t adjust enough for the first run of the second round. We got really tight, and tight around here is just scrubbing speed off and we couldn’t run as fast. Still, it was the 10th time in 15 races this season that Blaney and the No. 21 Ford Fusion have been among the top seven in Cup qualifying. Sunday’s FireKeepers Casino 400 is scheduled to get the green flag just after 3 p.m. Eastern Time with TV coverage on FS1.